Darwin, whilst voyaging in Patagonia, was one of the first to observe the impact of invasives, but it wasn’t until 1958 with Charles Elton’s the publication of “Ecology of Invasions by Animals and Plants” before much thought was given it. And only in the 80’s — during a conference on mediterranean climates, where speaker after speaker talked about invasives — that the study of invasions became a field of study. Nowadays it occupies the attention, resources, and budgets of many organizations, where invasive organisms threaten to displace natives. Lew Stringer (on January 15th, 2015) talked to us about what is involved in trying to make the Presidio and other places free of 3 weeds in particular: iceplant, mattress weed, and english ivy. Ice plant, Carpobrotus edulis, known in it’s native South Africa as sour fig, or hottentote-fig (it’s fruit is edible) has been in California for 150 years. It arrived in California with the intercontinental railroad, where the rail builders were using it to stabilize railroad levees, and in the 40s and 50s, CalTrans decided to use it for the highways now crisscrossing the state. People thought it was pretty, and soon it was being planted everywhere, and now can be found in pretty much every Mediterranean region. For years now, up & down coast, people have been working on removing it. 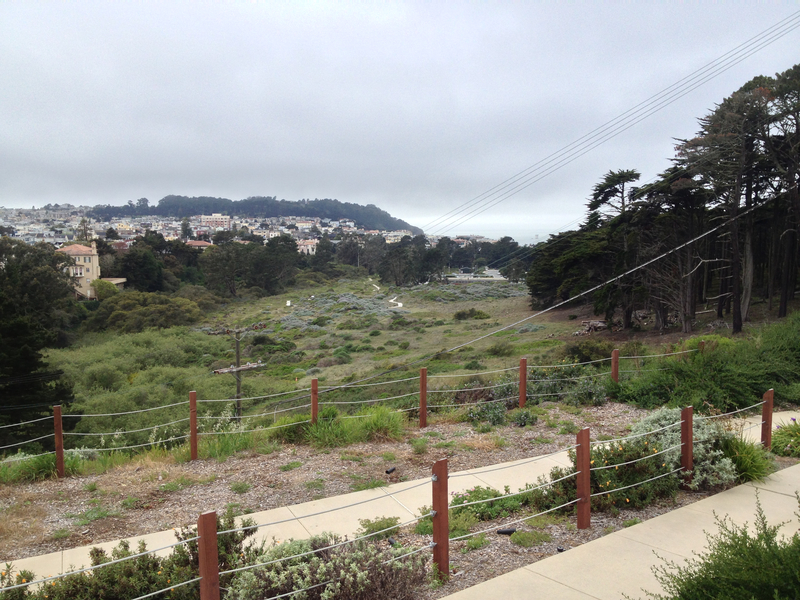 The Presidio has little left, mostly removed by hand over the years. It’s a labor intensive project, but easy to keep out. Point Reyes, has done it through various methods, but is soon to embark on a 3 year project using herbicides. Mattress Wire Weed, Muehlenbeckia complexa, or mattress vine (and a host of other vines) is from New Zealand where it grows in little clumps on dunes. Here, much like Kudzu, it blankets trees and shrubs, and vaults up trees and smothers them. It was first observed in 1971 on the North Coast. No one is sure how it came, but likely through gardening — it makes for great shrubs and topiaries. In the Presidio, it ended up blanketing a couple creeks (one which was only rediscovered in the 90s): Lobos and Dragonfly. Under the Mattress Wire Weed at Lobos Creek, they found tunnels under the canopy it was so dense. Both of the creeks have been largely restored to native habitats, but you can still find big piles of the weed at Sutro Baths. English Ivy is the big fight that remains in the Presidio — with an attempt to remove it in the historic forest, and replace it with other understory. The ivy was brought over from the Canary Islands in 1875 by a horticulturalist who was very excited by ivys. But it what we refer to as English Ivy is likely a swarm of species and it is likely a hybrid species. Hybrids are some times especially successful and the term hybrid vigor refers to this. It has become a problem in the Sierras, in redwood forests, and grows in a abundance under the eucalyptus on Mt Sutro. It is particularly hard to remove. It only produces seed when it leaves the ground. Weeders will cut the ivy at the base of the tree, so it is no longer reproductive. From there it is hard work. Although having a herd of goats can help — it takes vigilance to keep it from coming back. All this work to keep back invasives is both time and budget intensive. And it is becoming more controversial — especially where the removal of trees comes into play — and some people beginning to question whether it is worth it, looking at the novel ecosystems that form. Hawaii has seen a huge loss of species to invasives, but its overall diversity has not changed much. Not that that is always the case, take Sutro forest, for instance, which has low biodiversity because of the dominance of eucalyptus and english ivy. It is clear that invasions will keep happening, including more insidious ones like sudden oak death and other plant pathogens, some organizations are working on early detection networks and rapid response before things get out of control. We can look forward to continued discussion around the value of native plants, planted forests, and resistance to unwelcome plants. In the meantime, we can enjoy some of the wonderful landscapes in the Presidio that Lew has helped uncover.